Jalandhar: Widely considered as a “grandfather of music on console, legendary Punjabi singer & actor Surinder Shinda reached Lovely Professional University, today, and interacted with LPU students of ‘Performing Arts & Languages’. Near 600 LPU students accorded traditional Punjabi welcome to Singer Shinda and gathered advice from him to follow, absorb, uphold and propagate rich Punjabi folk culture till time immemorial. Sharing Punjabi folk-culture in depth and dimensions, he also performed on his all- time favourite and hit songs. 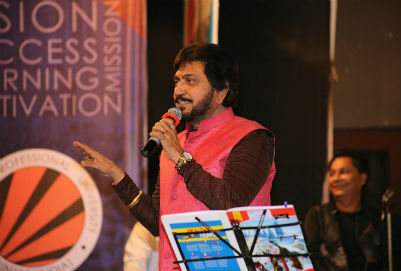 He also performed on original “Mirza” in “Dhaaeeyaa” sung in olden days by Peeloo Jee in “Raag Talang”. Surinder Shinda has provided numerous hit songs including “Putt Jattan De”, ‘Truck Billiya”, “Balbiro Bhabhi” and many more and has also appeared in Punjabi films including much popular Putt Jattan De, Uccha Dar Babbe Nanak Da. In addition, his album Putt Sardaran De proved great success in the Punjabi music market. In order to keep on inspiring youth, he is currently working as a producer for younger emerging artists.